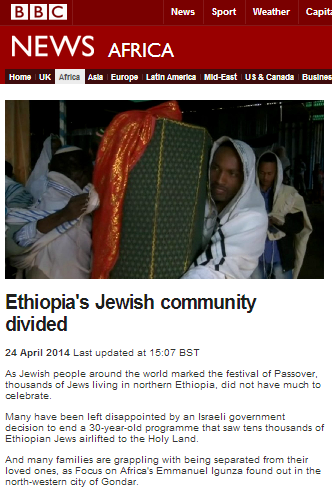 Here’s a heart-breaking story which was broadcast on BBC World News television and promoted on the Middle East and Africa pages of the BBC News website on April 24th under the title “Ethiopia’s Jewish community divided“. “Shouts of praise for the holy scrolls but make no mistake; this is not Israel. Welcome to Gondar – an ancient historic city in northern Ethiopia and home to the Falash Mura: the last Jews of Ethiopia. They spend their days living according to Jewish tradition, passed onto them over hundreds of years. The tranquility here betrays the emotional turmoil that many feel, not able to join their families in Israel. Stories of siblings separated, children allowed to settle in the Jewish homeland while their parents remain behind. Under the Israeli government criteria, only those Falash Mura who can show evidence of Jewish ancestry on their mother’s side are allowed into Israel and granted citizenship. The Jewish community here is big, numbering thousands, and right now they’re having one of their prayer sessions. But there has been disappointment in Gondar. Many hold the cherished idea of travelling to Israel but have not. But there is also a strong sense of determination to keep their faith strong and to make their lives much better. Abamesh Takiv [?] is a project manager with a local NGO helping poor Ethiopian Jews. Like many who she lives and works with, Abamesh wants to join her family in Israel. The problem with Emmanuel Igunza’s story is that he has left out some very critical details, the most obvious one being that the Falash Mura are Christians whose Jewish ancestors were converted by Western missionaries from around the end of the nineteenth century. Emmanuel Igunza, however, chooses to conceal from audiences the very issue which is at the root of the whole story and even takes it upon himself to define the religion of the people who are the subject of his report. That enables him to turn the story into one of poor Ethiopian Jews rejected by Israel: an obviously superficial portrayal of a much more complex issue with which Israel has been wrestling for many years. The framing of this story is of course particularly notable in light of other BBC reports on the Ethiopian community in Israel, not least the one by Paul Bakibinga which preceded Igunza’s item by a mere five days. Past BBC reports have not infrequently used the topic of the Ethiopian community as a hook upon which to hang none too subtle insinuations of Israel as a racist society which discriminates against immigrants from Ethiopia – see for example here and here. Now Emmanuel Igunza shows us that even Ethiopians in their native land can be used for the purpose of similar framing – just as long as certain crucial facts are made to disappear. Where did the BBC correspondent take Semicha? Disneyworld? The BBC is purveying pure Isra-hate propaganda. Duvidl’s London-based Ethiopian Jewish, Muslim and Eritrean Christian friends tell him they know plenty of Ethiopian Muslims, Christians and Eritreans who have pretended to be Falash Mura just to have a chance of going to Israel, never mind being granted citizenship. Some have been successful, according to Duvidl’s friends, who talk to them daily, some on Facebook. For instance, Eritrean Christians, who were deported to Eritrea from Ethiopia by the former Ethiopian dictator Mengistu Hailemariam in the eighties have also pretended to be Falash Mura. This is because they speak fluent Amharic, one of Ethiopia’s main languages, as well as Tigrinya, the main language of Eritrea’s nine languages. Duvidl wonders how many, if any of these languages, as well as Hebrew and Arabic, Emmanuel is conversant with. PS. Duvidl should clarify that Eritrea did not exist in the eighties, announcing independence in 1992, But both Mengistu and the subsequent Ethiopian dictator, Meles Zenawi, who died last year, both deported Eritreans living in Ethiopia to the border between the two during the preceding thirty years of war with the Eritrean People’s Liberation Front. Another seemingly deliberate attempt to aid and abet the “Apartheid State” slur.